Texture of parquet flooring can be brushed, sanded, sawn or hand scraped. Brushed texture is achieved with special brushing machine. This procedure gives the wood more structured texture. Wood is composed of soft wood and hard wood. With brushing, soft wood fibres are brushed out and only the hard wood parts remain. Hand scraped texture gives the wood distressed texture. This texture is hand made with special tools. Texture is time consuming and therefore costly. Hand scraped texture gives each plank unique look. Sanded texture is created with sanding machine and it smooth’s the surface texture of parquet flooring. Sawn texture is achieved when log is cut into planks. The sort of cut determines parquet stability. When parquet flooring is sanded it needs some sort of finishing. It can be oiled or lacquered. Finishing process is very important because if it is done professionally it brings out the best texture features of parquet. If parquet flooring finish is lacquered, it needs polishing occasionally to keep sleek glossy appearance. 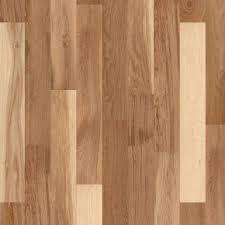 Parquet flooring polishing can be done by hand or with machine. Rustic parquet flooring is suitable for modern and classic spaces. Rustic parquet flooring appearance and texture is achieved with special ageing processes. 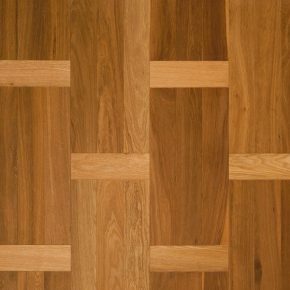 Parquet flooring materials for solid wood parquet flooring are different kinds of wood like oak, walnut, maple, teak, bamboo and others. Most common is used oak because it is widely available, it is durable and strong. All characteristics make it the best material for parquet flooring. There are two types of oak that is used for parquet. First type is red oak which has more porous wood and is more suitable for places with no humidity and second type is white oak which has dense wood and it can be used in moderately humid spaces. For use in bathrooms teak parquet is recommended because it is highly water resistant.